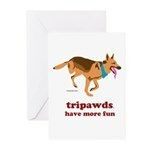 Many thanks to everyone who sent in photos for the 2012 Tripawds Calendars! With so many submissions we have created four calendars and two calendar prints this year. Every picture we received has been included in this year’s calendars. Check out the selection now to see the many inspirational photos of your Tripawds pals! 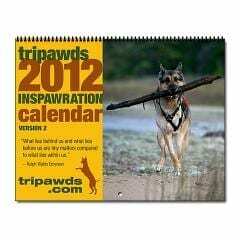 See All 2012 Tripawds Calendars Here! While most photos were suitable for full page printing, the lower resolution images we received have still been included. These images just appear smaller and share the month with other three legged friends of the Tripawds community. 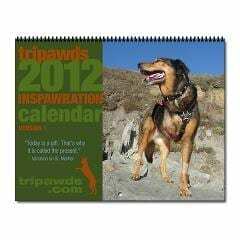 Three different 2012 Inspawration Calendars are available featuring inspirational quotes from Tripawds members. 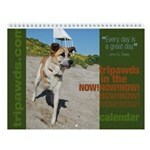 Another calendar features more Tripawd Heroes loving life as all three legged dogs do – in the Now! The two calendar prints include various dogs and inspirational quotes. 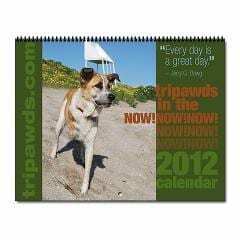 All the 2012 Tripawds Calendars make ideal gifts veterinarian offices, cancer centers, rehab vets, or anyone with a three legged dog! Order Now and Save with Gift Shop Coupon! Shop early and save! 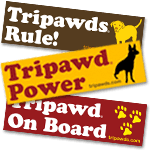 Use Cafe Press Coupon Code FOCT1140 and take 10% off all Tripawds Gift Shop orders over $40* now until midnight, 10/28. *10% off orders of $40 or more in shops only. Coupon code: FOCT1140. Sale starts October 27, 2011 and ends at Midnight, October 28, 2011. Save 10% off for CafePress.com shop orders of $40 or more, excluding shipping charges, gift wrap charges and applicable sales tax. All orders must be added to cart from cafepress.com shops only. Excludes CafePress marketplace purchases (e.g. all products added to cart from URLs beginning with the following (i) shop.cafepress.com, (ii) t-shirts.cafepress.com and/or (iii) cafepress.com/sk/), Gift Certificates, Flip products, SIGG bottles and CafePress Make and bulk orders. Coupon code FOCT1140 must be entered at check out. Promotion starts on October 27, 2011 at 12:00 a.m. (PST) and ends on October 28, 2011 at 11:59 p.m. (PST). Offer valid online at CafePress.com only, cannot be combined with any other coupons or promotions and may change, be modified or cancelled at anytime without notice. This promotion cannot be applied to past orders. Hurry for Your Tripawds Heirloom Ornament! Yay!!! Awesome!!! I ordered mine and I can’t wait to get it!!! Thank You So Very Much!!!!!! wonderful job admin guy!!! can’t wait to get our copies – holiday shopping just got alot easier!!!! These are totally pawesome! And, yup, Xmas shopping will be easy this year! Thanks for including my crummy low resolution pic of Tate! It is so great that you included everyone, very nice. What super pawesome news to receive on Charley’s 1 Year Ampuversary as a tripawd…and he is on March which is his birthday month! Isn’t it ironic!!! I can’t post it to hi blog though….my parents read it ’cause they are getting the calendar for Christmas!!! OMG – Frankie- aka -Mr. October 1 of 3 – would like to thank Tripaweds, God, The Kong company for making believe in magic, and most of all the iphone for capturing that awesome moment! * we just bought 4 calendars….I am guessing we will be about 25 deep by christmas!! I got the calendars on Wednesday! Yippee! They turned out beautiful!!! High quality and totally inspirational!!! Charley looks great as Mr. March! I’m one proud mommy! WOW! I missed this blog post! So cool!!!! Off to order!